Old fashioned chicken and dumplings is a southern classic dish made with a whole chicken, warm broth and hearty scratch dumplings. When old man winter comes knocking at my door, it's time to hunker indoors, warm up by the fireplace with a cup of hot cocoa and enjoy all my favorite winter comfort foods. 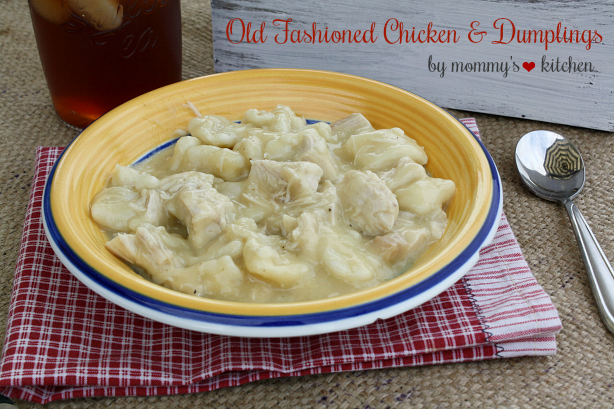 Some of my favorite cold weather dishes are garden harvest stew, venison chili, creamy chicken and noodles, chicken spaghetti, chicken and dressing, pinto beans with ham and cornbread, chicken corn chowder and this Old Fashioned Chicken and Dumplings. Some people think chicken and dumplings is hard to make, but it's really pretty simple. I like to use a fresh whole chicken, but a store bought rotisserie chicken can also be used if you're in a pinch for time. See my note at the end of this post for directions on making this recipe using a rotisserie. 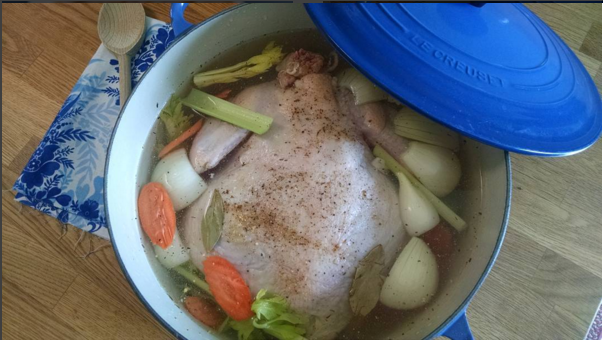 To make the broth, I add enough water to cover the fresh chicken and then add a cut up onion, carrots, celery, celery leaves, bay leaves, garlic powder, poultry seasoning, butter, salt and pepper to season the broth. The chicken should be cooked in about an hour. Once cooked, remove the chicken to cool, strain the broth and discard the veggies and the bones. Now you have a beautiful, flavorful broth, perfect for chicken and dumplings. Just add 5 cups broth back to the pot and cream of chicken soup. Blend using a wire whisk. Pull the chicken from the bone, add the cut up chicken to the broth, return the broth to a boil and add the dumplings. You can make homemade dumplings or use a biscuit baking mix (such as Bisquick). I've made this dish using both. Scratch dumplings are the best, but my husband loves both versions. I hope your family enjoys this dish as much as mine does. Clean out the inside of the chicken, removing the heart, liver and giblets. Add the whole chicken into a large stock or soup pot. Add the celery ribs and leaves, carrots, onion, bay leaves, poultry seasoning, butter, garlic powder, salt and pepper. Add enough water to cover the chicken. Over high heat bring the chicken to a boil, reduce heat, cover (leave a 1-2 inch opening for the steam to escape) and simmer on low for 1 hour or until the chicken is cooked through. Remove the chicken to a serving plate to cool. Strain the broth into a mesh strainer and discard the vegetables and any small bones. Add 5 cups broth back to the pot, cream of chicken soup and butter. Using a wire whisk mix until the soup is blended. When the chicken is cool enough, pull all the meat off the bone and add chicken back to the pot with the broth. Discard the chicken bones and prepare the dumplings. To prepare dumplings: In a medium size bowl, combine the flour, baking powder and salt. Mix to combine. Cut the butter into the flour mixture with a pastry blender. Stir in the water or broth and blend until the dough forms into a soft ball. On a floured surface using a rolling pin, roll out the dumpling dough to 1/4 inch thickness. Using a pizza cutter, cut the dumplings into 2-3 inch squares. Add the dumplings to a bowl of flour and lightly toss. Bring the broth to a boil and add the dumplings (shaking off the additional flour before adding). Reduce heat to low. Continue until all the dumplings are coated and added to the broth. Simmer the dumplings for about 20 minutes, pushing them down with a wooden spoon into the broth every 10 minutes or until they no longer float. Continue cooking until the dumplings are done and the mixture thickens to the desired consistency. Cool slightly and ladle into bowls. Cook's Note: a Store bought Rotisserie Chicken can be substituted for a whole chicken. Remove all the meat from the chicken and set aside. 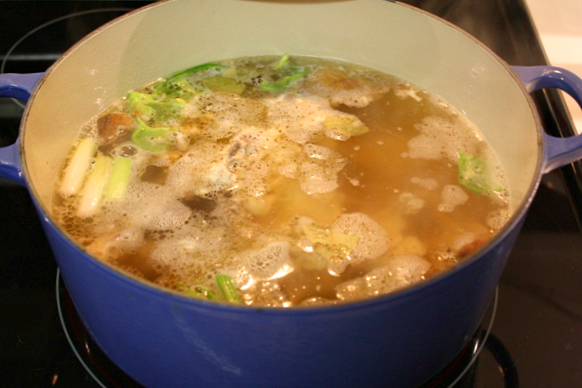 Place the chicken carcass into a large pot and cover with water. Add celery ribs, carrots, onions, pepper and bay leaf to flavor the broth. Bring the mixture to a boil, reduce heat and simmer broth for 30 minutes. Strain the broth through a mesh strainer and discard the bones and vegetables. Add the broth back to the pot and continue with the recipe above adding the chicken, cream soup, butter, salt and pepper if needed and dumplings. Want to stay connected & up to date with Mommy's Kitchen? Don’t forget to follow on Facebook, Instagram, Twitter & Pinterest! Mommy's Kitchen is also mobile, click HERE to download the FREE Official Mommy's Kitchen iPhone App. When do you add the can of cream of chicken soup? I read over the recipe several times and I can't find when to add it. I'm sorry Marcia, I fixed it. This is what I get for trying to add a blog post at 11:00 pm. I hope you like the recipe. I love chicken and dumplings and you know what, I have never made it and I'm so ashamed to say so. Since the weather is cooler I think I'll try and make this for my family, my mom use to make chicken and dumpling. I've heard about chicken and dumplings being a good comfort food. I haven't tried it yet, though. The final dish looks really appetizing…I'm a fan of warm, creamy dishes like this. I LOVE chicken and dumplings. My grandma used to make the best. Mine is good but not as good as hers. It's similar to yours except you have a couple ingredients I don't and I think that might just make the difference and make it just like grandma's! Anytime I see a recipe for Chicken and Dumplings I instantly go back to my college days. Weird I know. But my roommates were all from the south so they loved to cook Sunday dinners. Chicken and Dumplings was one of the meals we had a lot. SO GOOD! Yum! 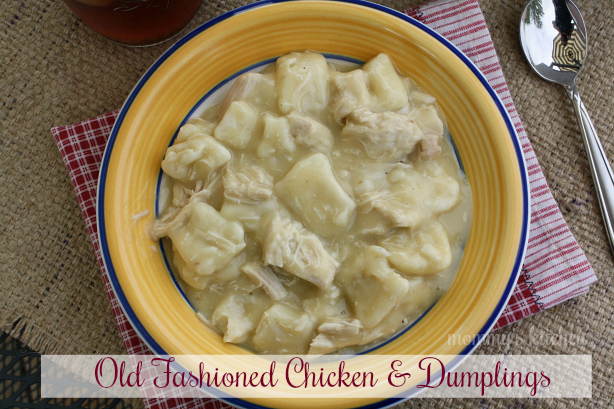 These old fashioned chicken and dumplings are a reminder of my childhood. My mom would often prepare this dish when we feel tired and weary. It's a great comfort food that's a classic in our family. We love Chicken and Dumplings! I usually cook the chicken the day before to save time but loving the idea of buying a rotisserie from the store. This sounds like a good basic recipe. I've never tried a rotisserie chicken, but I have used refrigerated biscuits many times. While a bit different consistency than the rolled dough, they work fine and just as tasty. I always get the plain biscuits and cut in thirds. Great cold weather comfort food. Do you mean we add the butter before we boil? It doesn't go in when we add the cream of chicken soup?